Divine Mercy Sunday is celebrated on the first Sunday after Easter Sunday. So this year Divine Mercy Sunday was celebrated on Sunday, April 3, 2016. Last year I wrote a post on 7 Ways to Celebrate Divine Mercy Sunday with Children (and Adults too!) Don't know much about Divine Mercy Sunday? No worries! I'm still learning about this devotion myself with our family and we just started celebrating Divine Mercy Sunday in 2014 and 2015 and now this year. To read more about Divine Mercy Sunday, this Jesus and the Divine Mercy post is a great post to read. On Divine Mercy Sunday this year, we went to our parish at 3:00 PM to pray the Divine Mercy Chaplet and then the priest offered confession and then there was a closing prayer. After praying the chaplet, I went to a baby shower for one of my friends who is expecting her 2nd baby. 2 of my daughters came to celebrate this new life too! 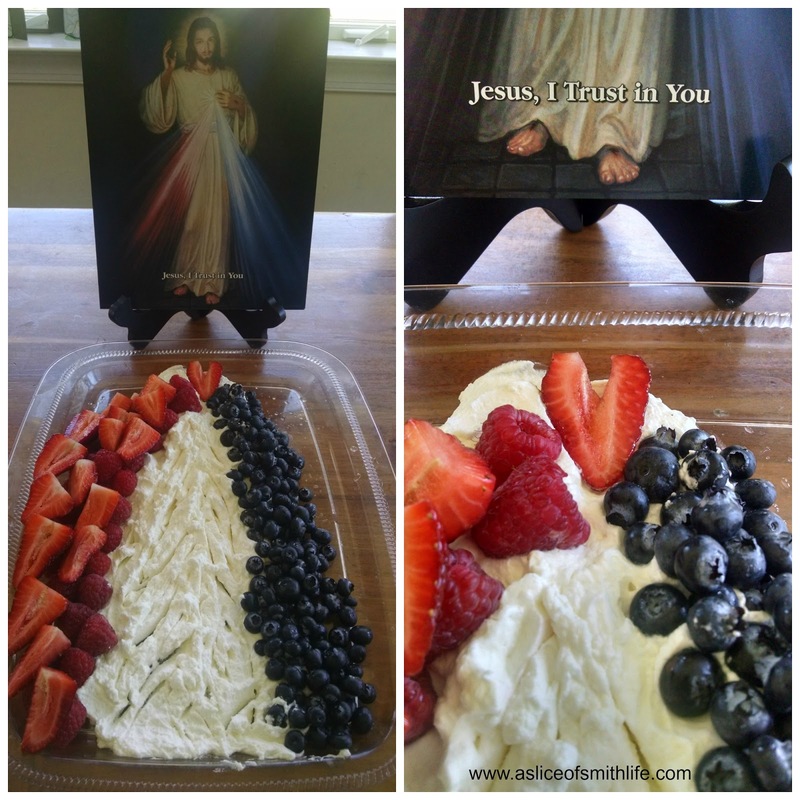 I brought my Divine Mercy fruit platter I've made in the past and this year I added homemade whipped cream to the fruit "rays". My daughter made the whipped cream which is really easy and fast to make. I don't think I'll every buy Cool Whip again! Put all ingredients in a mixer until cream thickens. 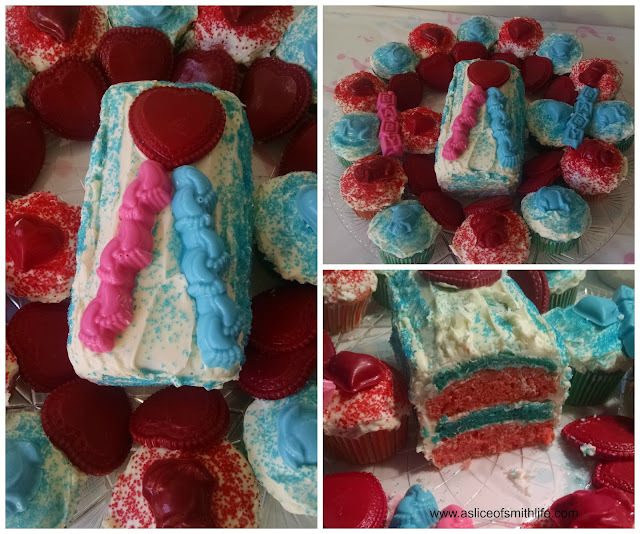 My friend, Karen, who hosted the baby shower, made this adorable baby shower cake and cupcakes that had the Divine Mercy theme as she made pink and blue feet "rays" with chocolate red hearts. The inside of the cake was pink and blue. 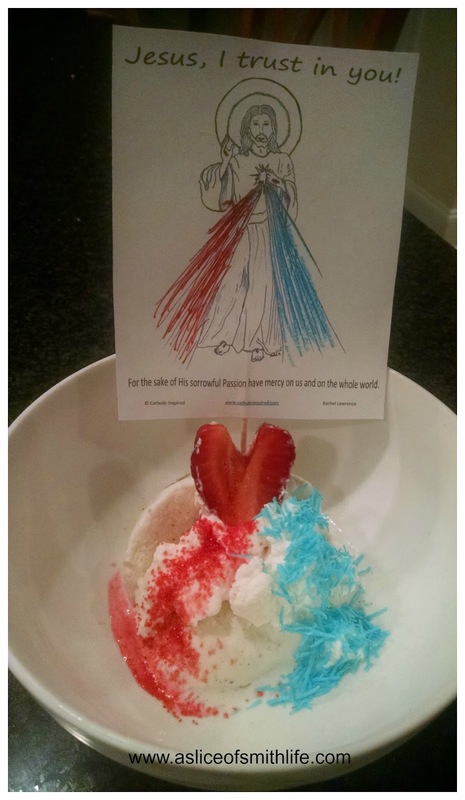 Later in the evening when we came home my children that didn't have delicious cake at the baby shower made themselves some Divine Mercy "Sundaes", a tradition we started a few years ago. I like to make the heart out of strawberries by cutting a strawberry in half and then take a paring knife to cut a "V" out of the top of the berry. Did you read about the Divine Mercy miracle that happened this year in Greenville, SC? Check out this post and the pictures. What do you think? And if you are looking for even more information on Divine Mercy be sure to visit The Divine Mercy webiste and also Catholic Mommy Blogs has a great post on How to Prepare Yourself and Teach Your Children About Divine Mercy. Wow!! I didn't hear about that amazing event/miracle! It certainly looks as if the Lord is shining down on the crowd and the DM picture....that's unreal! thanks for sharing! your dessert and your friend's cake are lovely! Just perfect, the way you guys celebrated! Homemade whipped cream? Yum! I've never tried before, but it sounds delish! I know isn't that DM miracle something else?!!? Love it! Thanks for your visits always! If I can make your butter lamb, you've got to try the recipe for homemade whipped cream and tell me how you like it! :) Just do it!